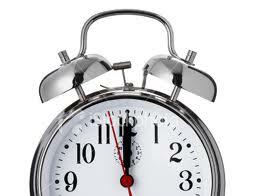 Free shipping ends at midnight A.T. (Atlantic Time) tonight...as coincidentally so does the year! 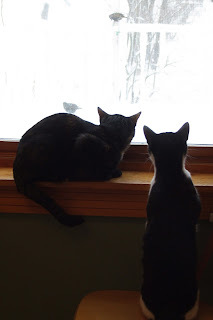 We are having a snowstorm, and the feeders are filled with Starlings - noisy, raucous, aggressive Starlings. The young bird watchers are quite taken with them. Despite having a snowstorm day yesterday which kept me inside at the machine for most of the time, progress on the Epiphany antependium was minimal. I've been pondering what shape I would like the bottom to be. Squared off seems so ho-hum. 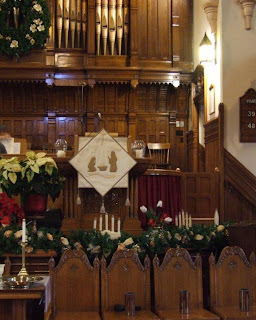 First I thought a long, ovate, heraldic-looking shape ending in a point capped with a single tassel would be the ticket, but it left too much plain area where the Magi didn't fit. The kings have been designed to fill the width of the space almost completely. What I hit upon was a shape reminiscent of the top notches on a castle wall - think of the rook in a chess set - but slightly rounded, and more in the style of architecture we often see used for Bethlehem 2000 years ago. I gathered up some plates from the kitchen to try out some semi-circles. 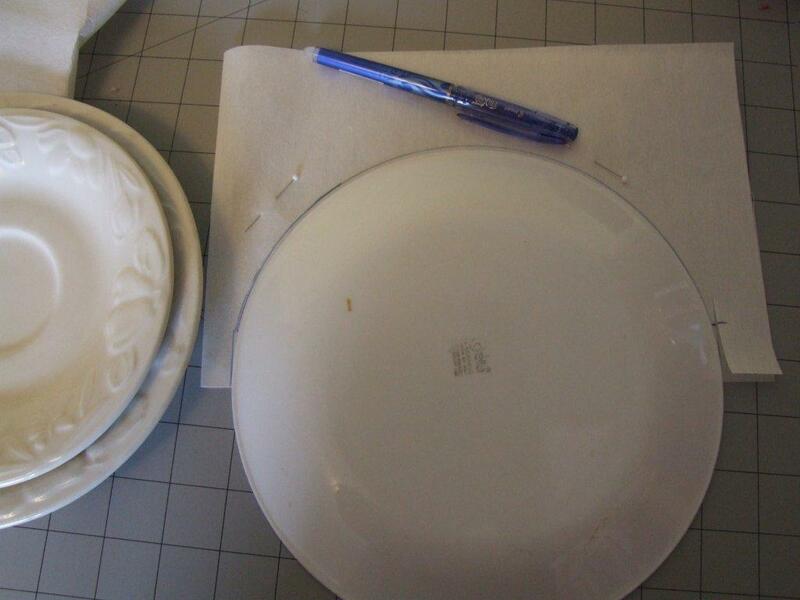 An old Corelle luncheon plate was the perfect size. Often I use freezer paper to draw the templates, but Pellon Stitch-N-Tear is so handy: it's 20-1/4" wide, which is the exact measurement of my finished piece. I folded it in half so that my circles would be identical. This is what I've ended up with, and I like it. 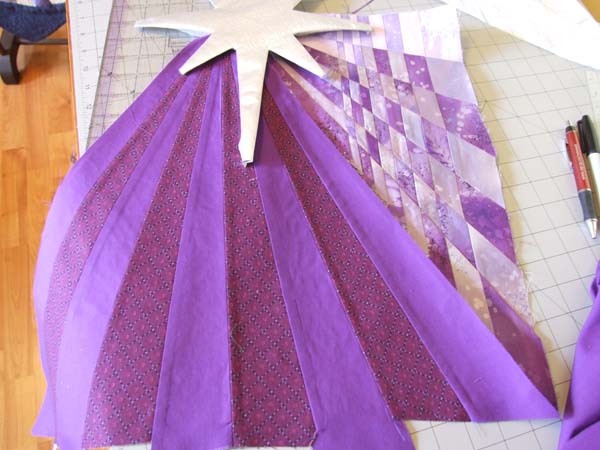 The finished version will be a bit shorter than shown here and will have a white tassel on each point. 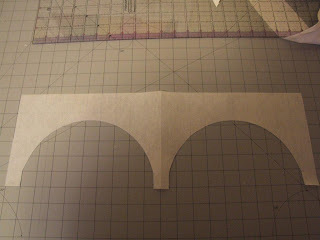 It will require bias binding to finish this edge when the time comes. After a wonderful (albeit long!) day for presents and travelling to be with family yesterday, I am back at work on Boxing Day to try to get the antependium finished up in time for Epiphany. As I stitch today I am listening to the music of Jack White, courtesy of youngest son who knows what I like. Epiphany means “manifestation” or “revelation" and is linked with the visit of three wise men (Magi) or kings to the baby Jesus. Traditionally, the Magi are portrayed as wearing very ornate and expensive clothing and bearing valuable gifts. One thing I've learned from years of stitching - both my own and in observation of the work of others - is that there is a fine line between "ornate" and "tacky". Therefore, I tend to err on the side of simplicity and understatement. 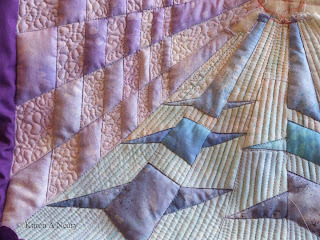 I am using an assortment of silks - habatai and dupioni - and balancing the embellishment of the fabric in both subtle and not-so-subtle ways. 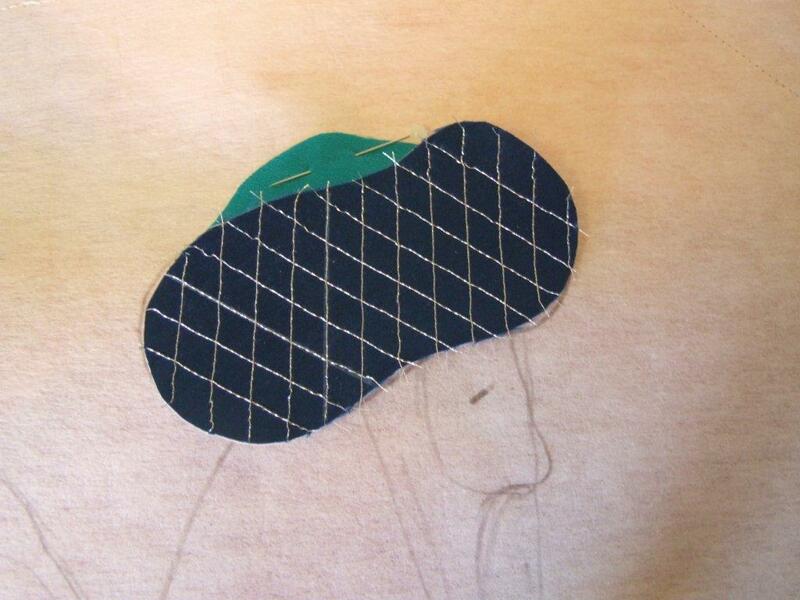 For the top of one king's crown, I used my pintuck foot and a twin needle to create texture in the gold. Tightening the top tension as high as it will go pulls the fabric up in ridges, eliminating the need to measure, mark and fold each tuck. 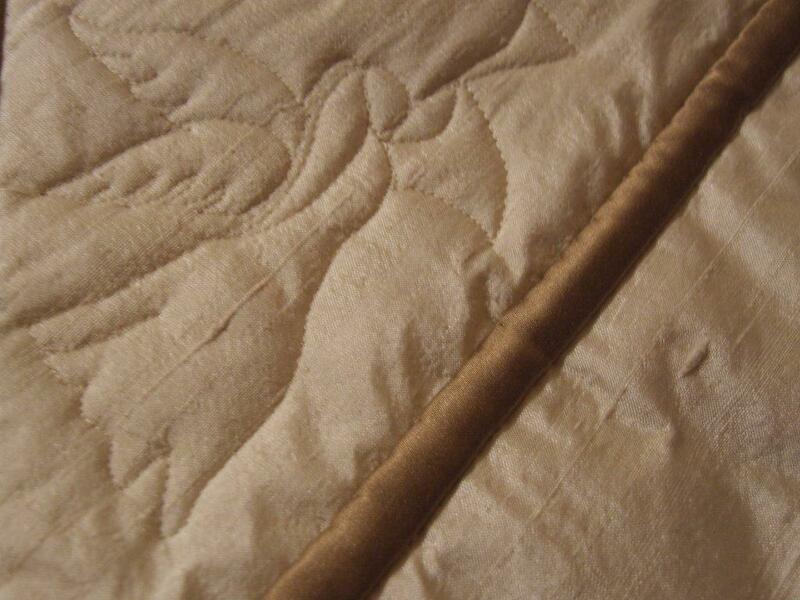 It's a great way to create faux pintucks, and it worked beautifully in this Chinese silk. 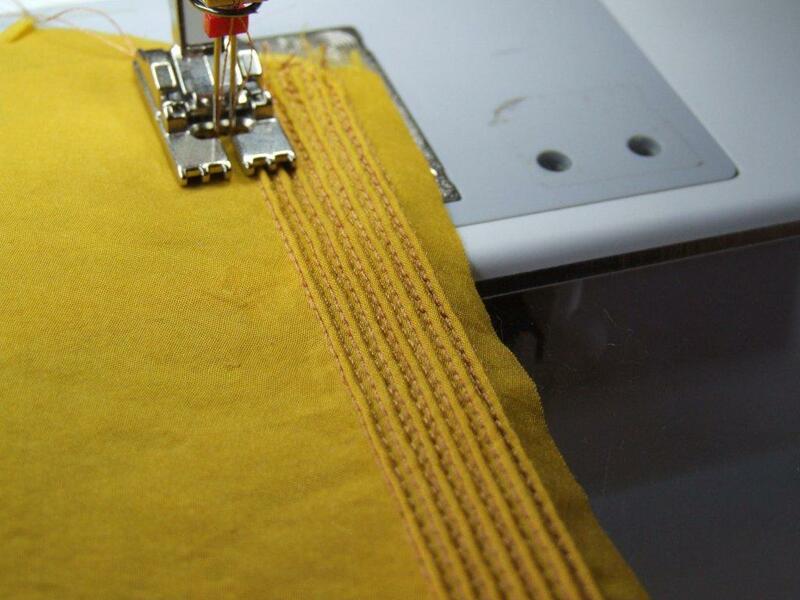 If you are a Bernina user, it's foot # 31 and a real gem. I've purchased a pintuck foot for every machine I've owned; I love pintucks. 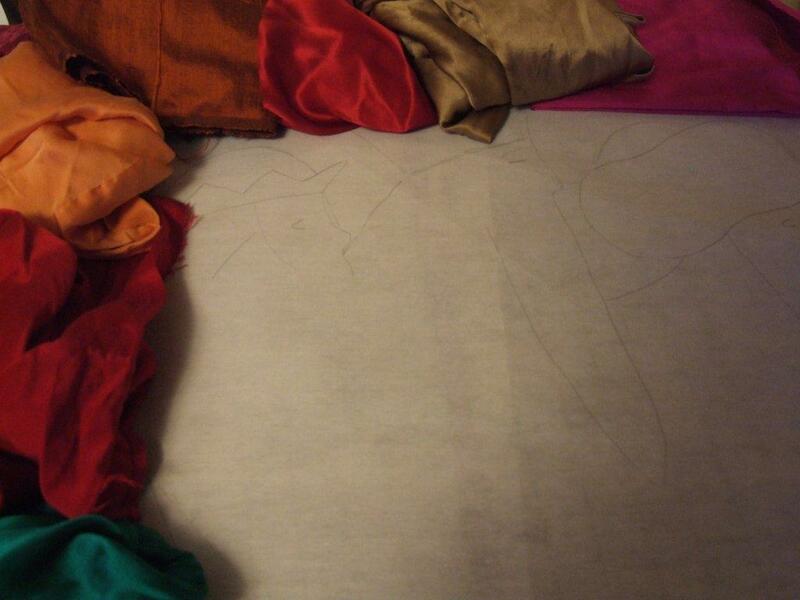 This is my first time doing them in silk, and it definitely will not be my last. 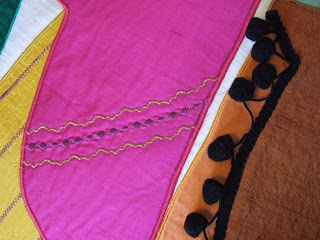 Some decorative stitching using the built-ins on my machine, and some top-stitched purchased trims will be just enough to send the message that these are no ordinary folk trudging through the dessert. On that note, I am still chuckling over Jennifer's comment from the other day where she wrote: I often wondered how those blokes kept their rich robes looking so good in the sandy desert.....there must have been the odd Mrs Magi or two in the background, I think. 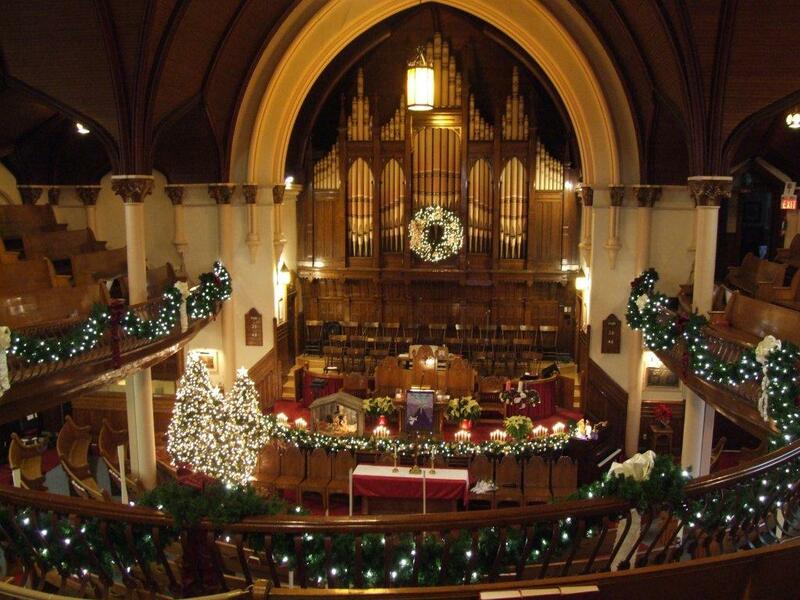 Wishing you and yours the simple peace and joy of Christmas. ...and the creature that's stirring looks nothing like a mouse. We decorated the tree Saturday morning. We decorated the tree Saturday afternoon. We decorated the tree Saturday evening. 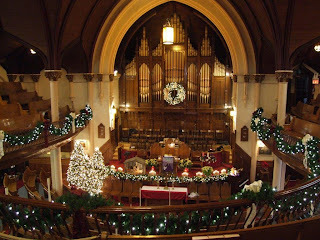 We decorated the tree Sunday morning. We decorated the tree Sunday afternoon. We decorated the tree Sunday evening. 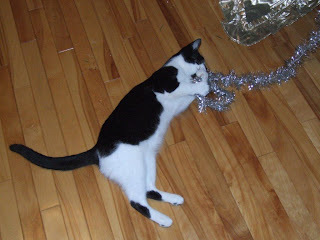 We decorated the tree this morning... Maddie...!!! 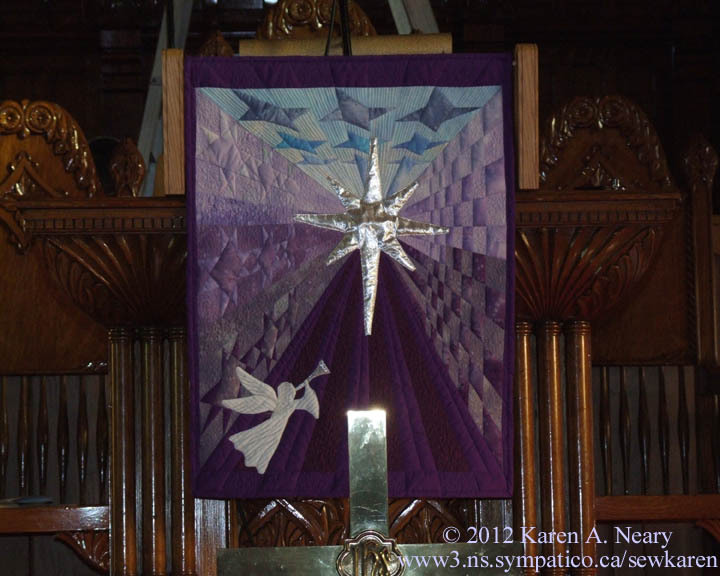 It seems we just marked the first Sunday in Advent, and now we are up to the last. Terry Albers of Hedgehog Quilts sent along this picture of a table runner made using my Gift Scrapped pattern. Terry writes: "I made all my "gifts" in white and my ribbons in colors. 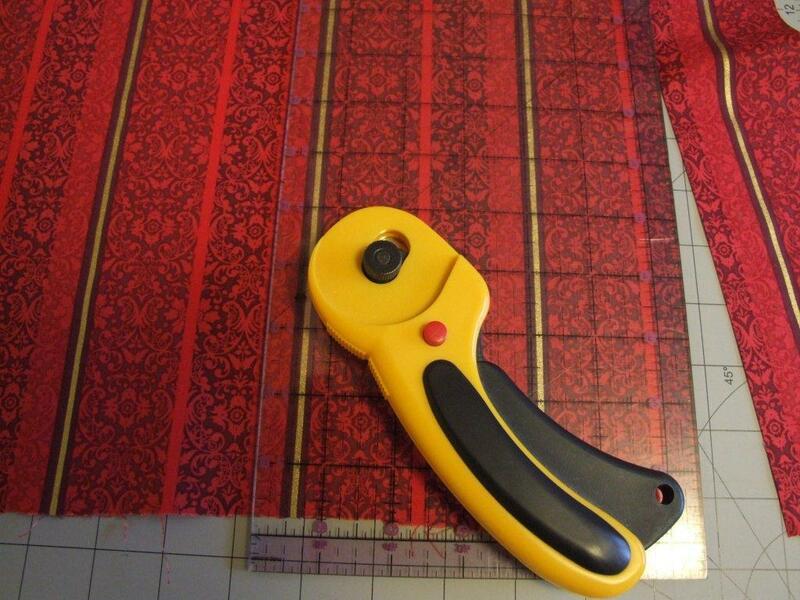 I am putting a little yo-yo on each with a small crystal button in the center, making it look like a little bow. It was fun to make." Terry's yo-yo idea is so clever - I love it! 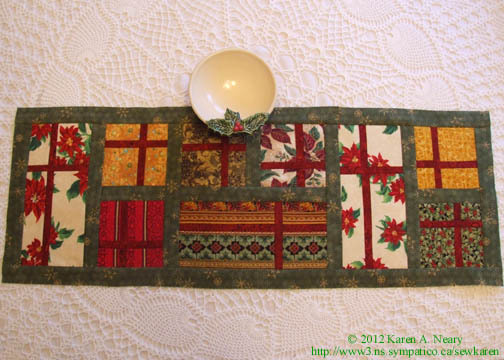 The pattern for Gift Scrapped is available here; it includes instructions for a placemat, runner, and lap quilt. Thanks Terry for sharing the picture! The antependiums I have been stitching are a calendar of the church year. With Christmas finished, we move on to the new year. 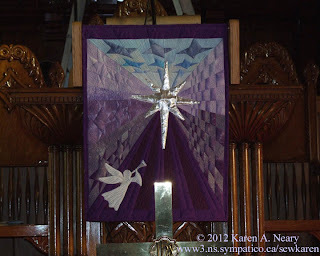 Last year I started with Easter so by April I will have completed an entire liturgical season. On New Year's Day, the church will hang a banner which includes all the colours of the liturgical calendar: green, purple, white and red. Drum roll...The Christmas quilt is sewn, tested, and photographed. It's ready to roll. I am dying to tell you the name as it makes me chuckle whenever I think of it. As mentioned in a previous post, this project is designed for scraps. I've also mentioned on previous posts how heavily into puns and word play we are in this household. I was casting about for a good name (thinking along the lines of a play on presents/presence...) and casually asked my son Patrick if he had suggestions. 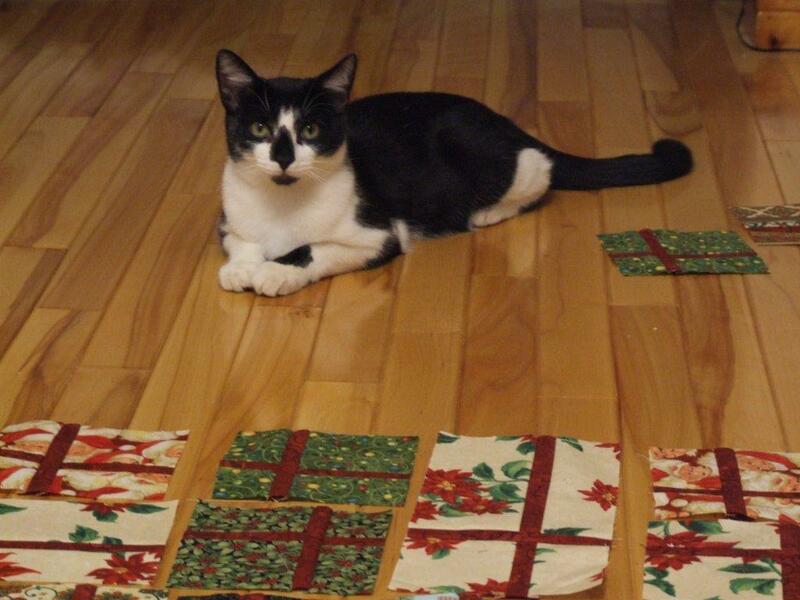 I told him the design used scraps pieced to look like wrapped presents. He shot back with, "oh...you mean it's Gift Scrapped!" I love it!! 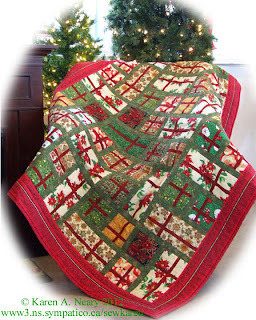 Here's Gift Scrapped...about the easiest, quickest quilt you can imagine. It's all straight sewing, rotary cut, no templates, and no seam matching. You can twist and turn the gifts different ways to add a bit of variety in the layout. The pattern includes directions for a lap quilt, table runner, and placemat. I pieced the blocks for the lap quilt easily one afternoon. 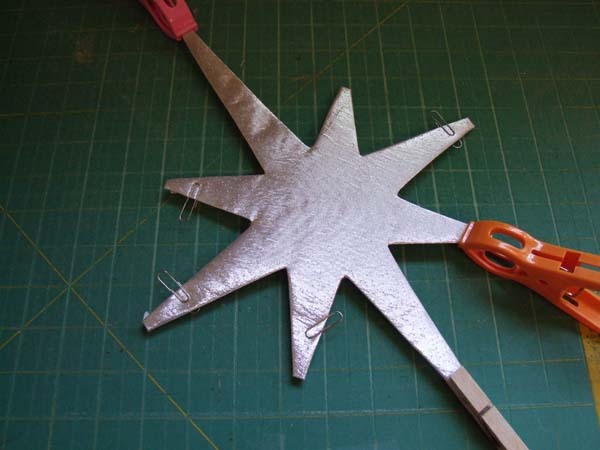 The testers who proofed the pattern were equally enthusiastic about the ease of the project. 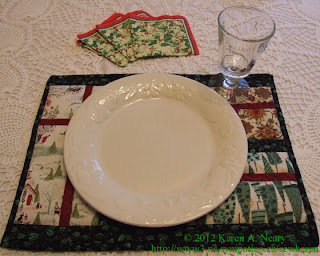 Here's a placemat made by tester Darlene Gerber of I Quilt Scarlet & Grey. Darlene previously tested my Roundabout Again pattern; she does great work. 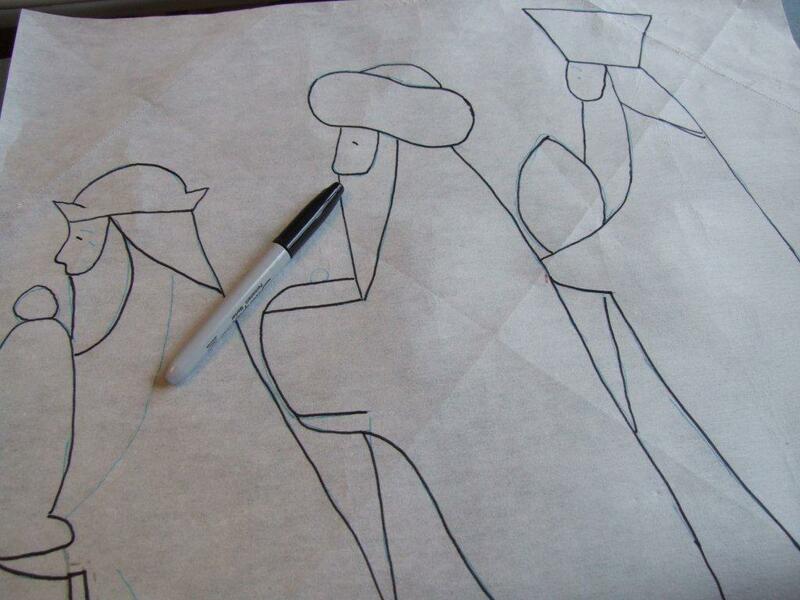 Grace Blanchard from Wisconsin was no time making her placemat. 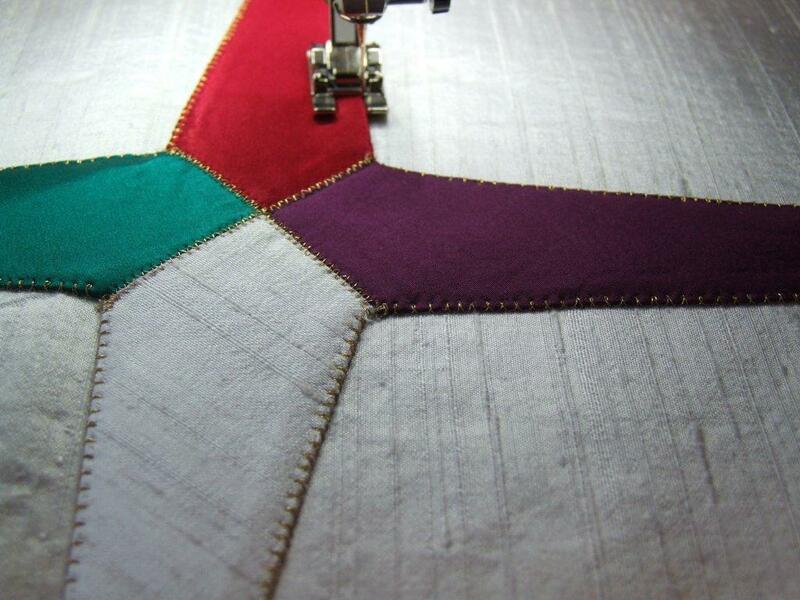 She is one fast quilter! 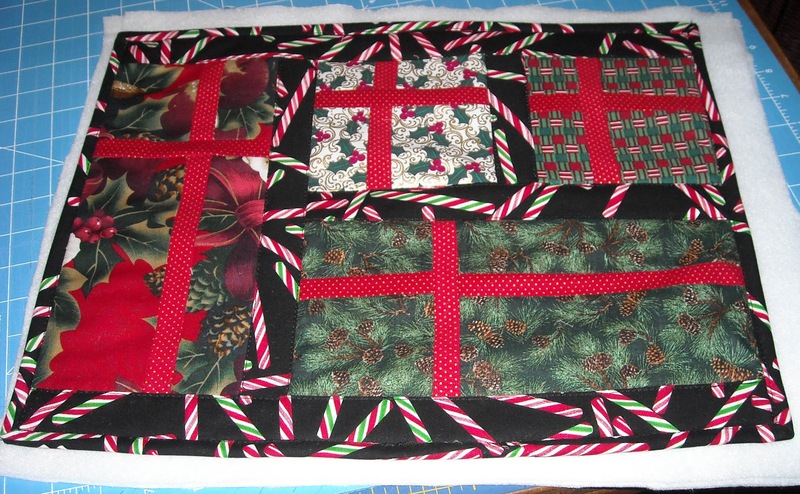 I love the black candy cane fabric she chose for the sashing; it really sets the blocks off nicely. 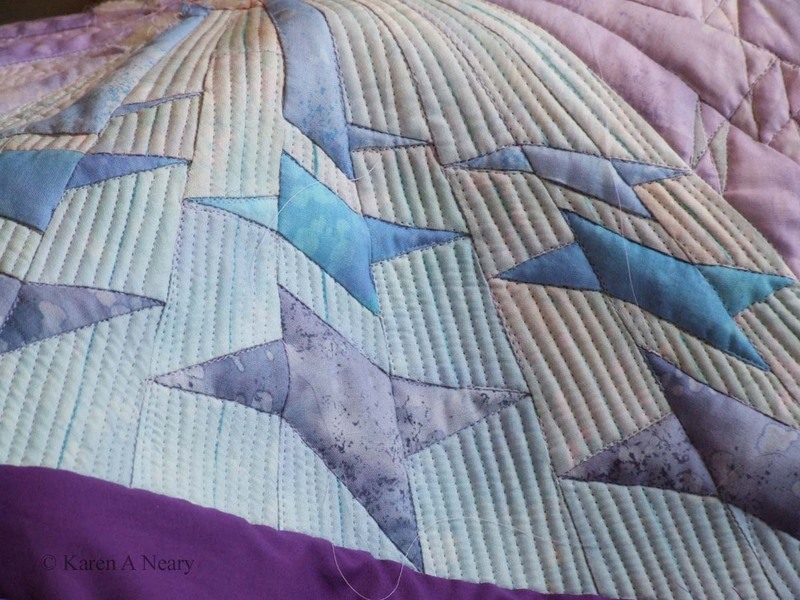 Debbie Grifka of Esch House Quilts in Michigan turned her blocks into a runner. I like the white ribbon she chose for her gifts. 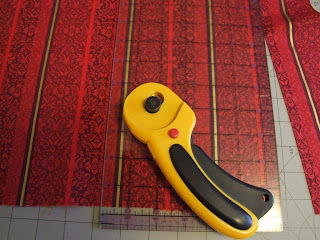 Tester Sandra Hulsey pointed out that this is a perfect pattern to use Fat Quarters and Fat Eights rather than scraps. 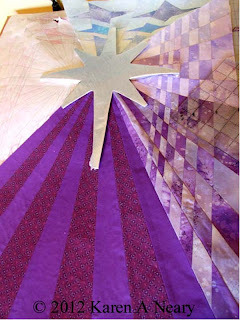 Wouldn't this be pretty done in a coordinated collection? My friend Cheryl suggested the Craftsy site as a great way to make this pattern available. Hers are very hot sellers there. I have used Craftsy in the past, when my fingers were more cooperative, to download some of Cheryl's sock patterns. The site is very easy to use, and free to join. You choose a user name and password and use your credit card to download the patterns directly to your computer. 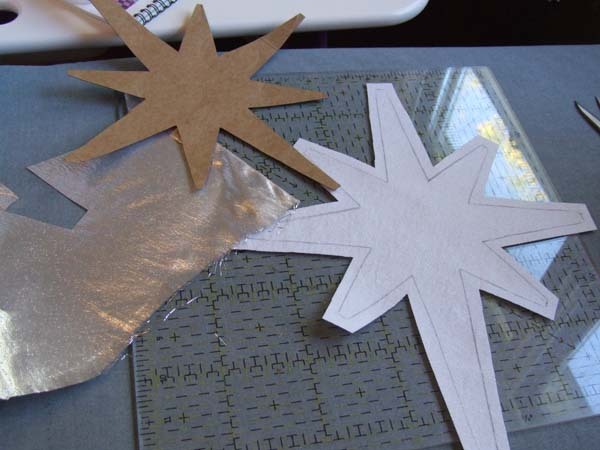 The digital patterns are less expensive than printed versions, and you receive them immediately. The pattern for Gift Scrapped is $7.00, and you can find it at this link. My sincerest thanks to the testers who undertook a challenge this close to Christmas, to Beth Munroe who obligingly moved the furniture - including a lit Christmas tree! - around Mrs. Pugsley's Emporium for the photo, and to Cheryl for her always good advice. 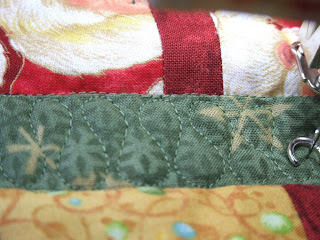 It's a fun pattern and pure joy to sew, and - as Beth says - it's happy and bright and all things Christmas should be. I'm also happy my son came up with this name! 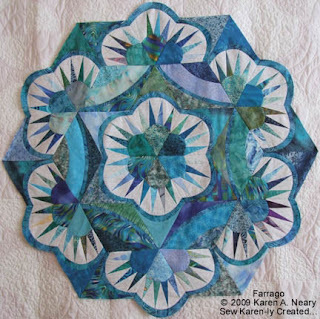 The delivery itself was not such a surprise, as I was expecting my Farrago quilt back from IQF Houston. What was surprising though was that the parcel was delivered just a few moments ago...on a Sunday, in Nova Scotia. I don't recall that ever happening before, but I suspect the volume of Christmas mail at present has Canada Post working overtime. Farrago has had a stellar run of shows and I am happy to have it back home now for a bit. 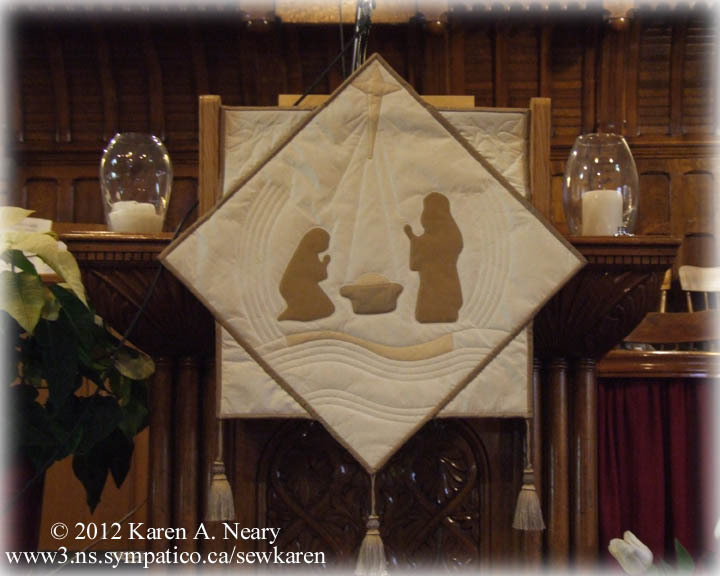 It's one of my favourite quilts. Then it was time to layer and baste the quilt. It is by far not my favourite thing, especially with two kitty helpers. 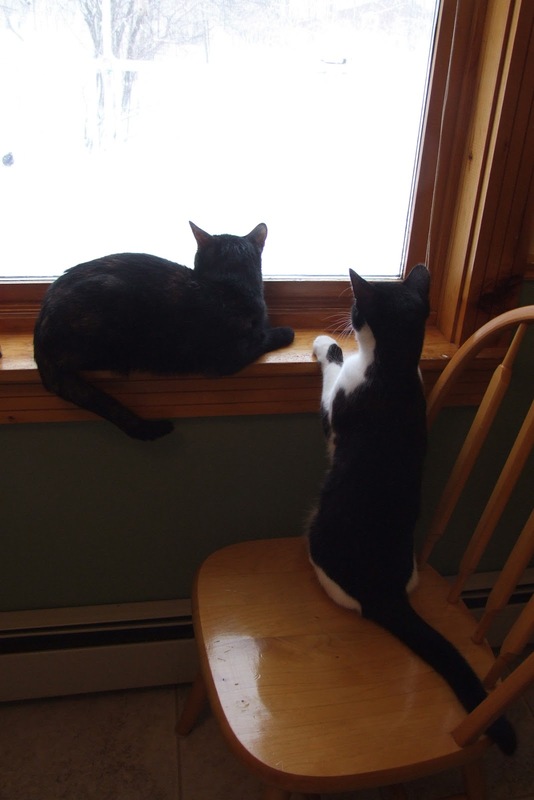 They went outside for a run and the task was quickly completed. 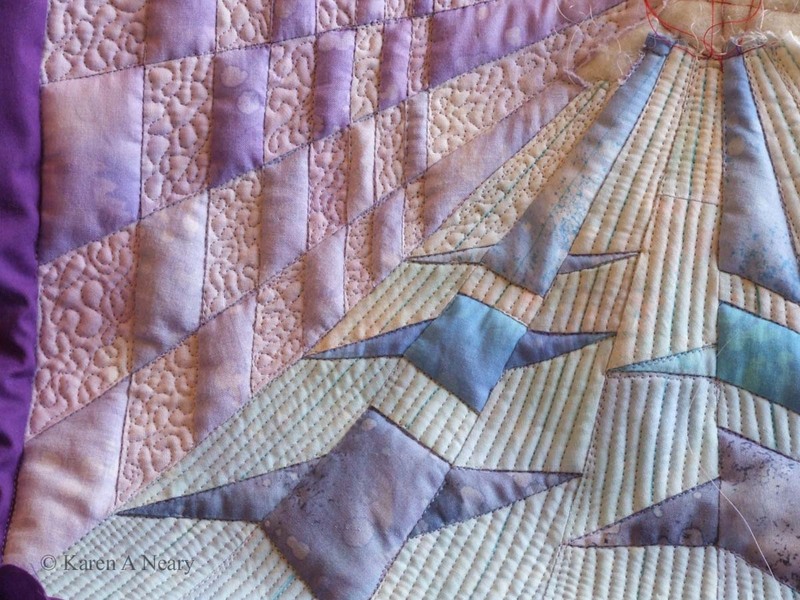 The next step was to decide what to quilt. 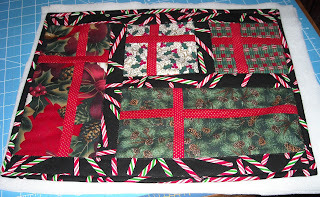 There is sashing between each of the "presents" and I wanted it quilted down so the boxes would pop up. 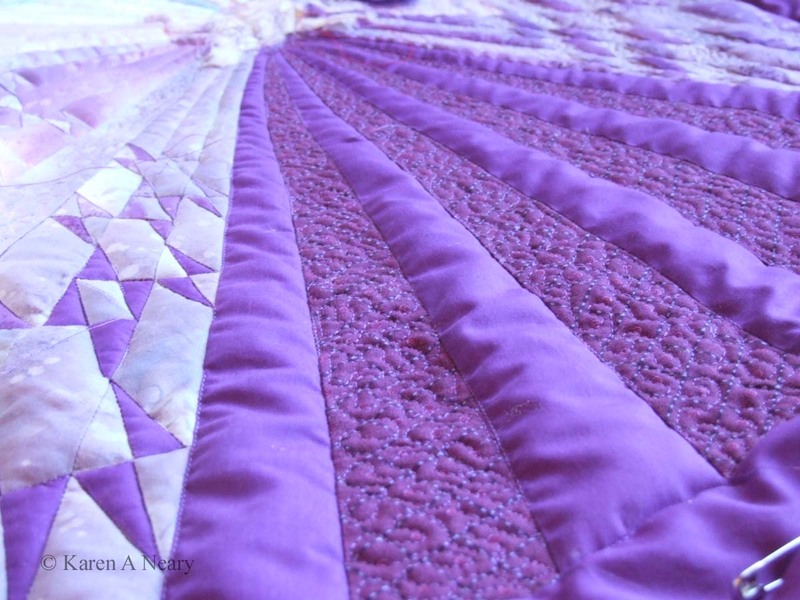 I also wanted something appropriate to the quilt, and "ribbon candy" seemed perfect. 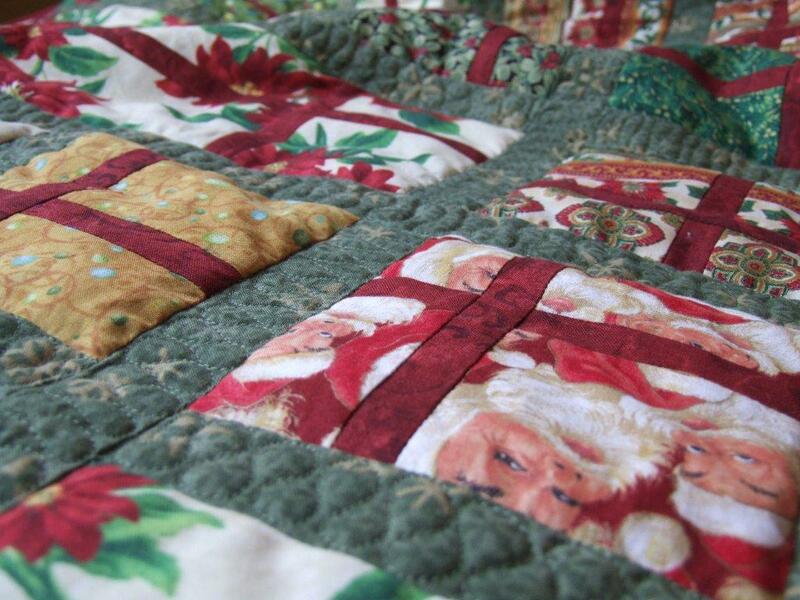 I had never quilted this shape before, but certainly am familiar with the treat from my childhood Christmases. 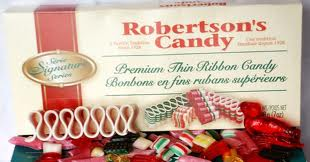 Robertson's Candy, made in Truro, N.S., is a Maritime staple for Christmas treats: barley candy, humbugs, chicken bones, satin mix and ribbon candy. 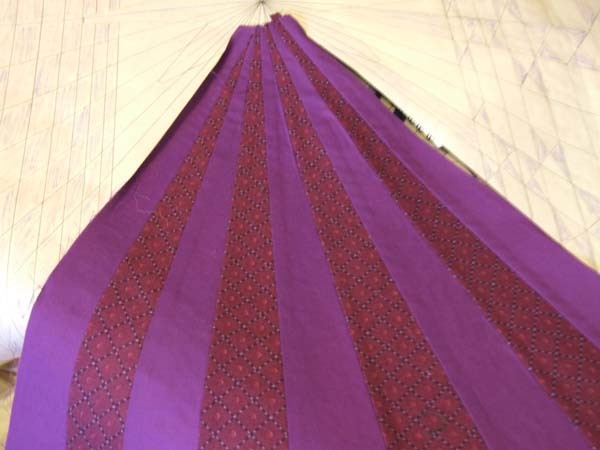 You can see that the shape of the ribbon is perfect for a long, narrow sashing. It certainly had the desired effect as the presents are popped up like pillows. 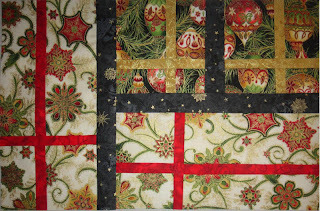 I will add some detail to the red ribbon next and then on the border. Almost there! Two testers have already reported in with positive results, so once I hear back from the others the pattern will be available for purchase. As a small thanks for your wonderful support, for the remainder of 2012 (i.e. 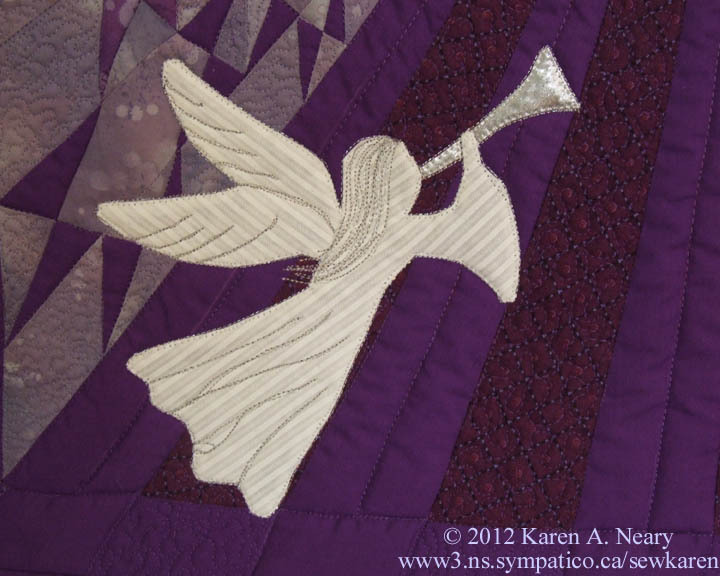 to midnight on December 31, 2012) postage for all patterns will be on me. 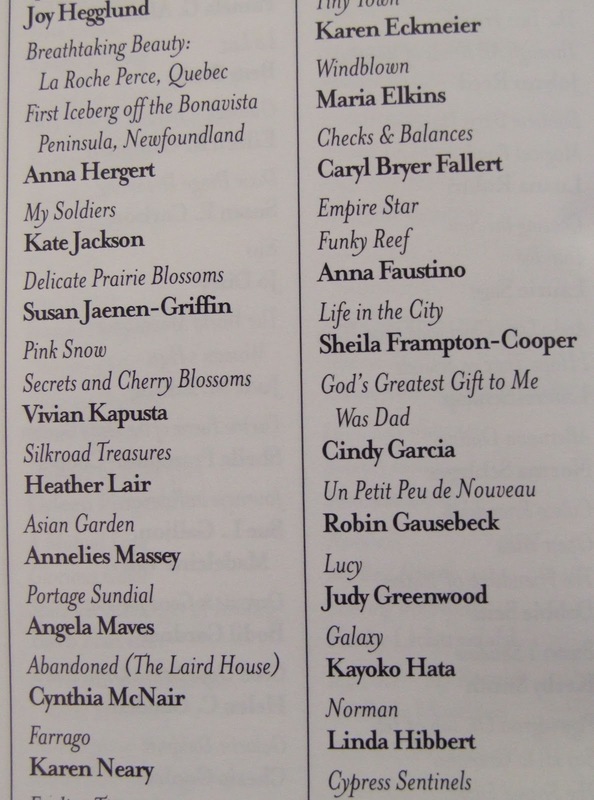 (This does not include the book Canadian Heritage Quilting.) 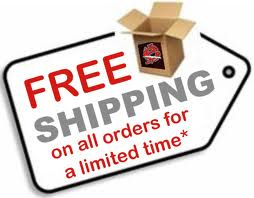 The postage will be adjusted manually after your order goes through the checkout; I will immediately reverse the charge - no code needed. 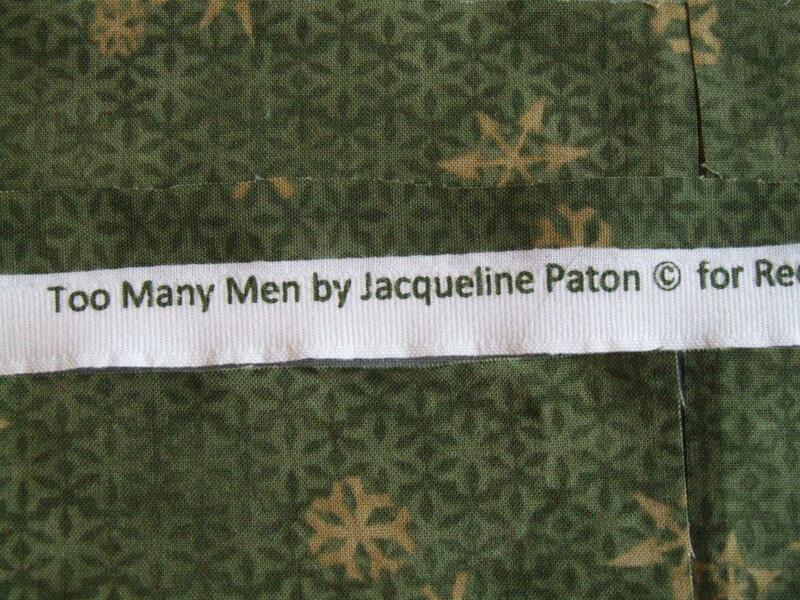 Visit the patterns page of my website here. Merry Christmas! 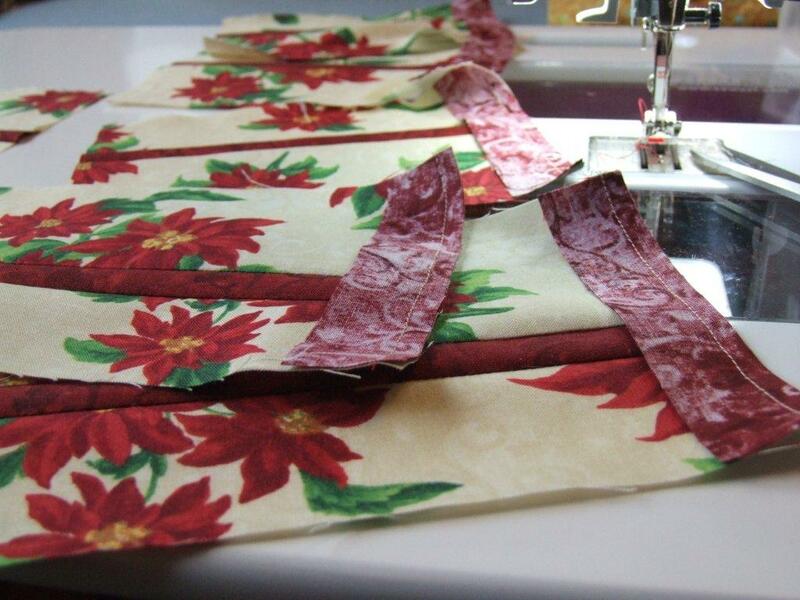 I took a break from serious quilting to get some gifts sewn. All I found when I opened my bulging box of Christmas fabric was scraps. Hmm... 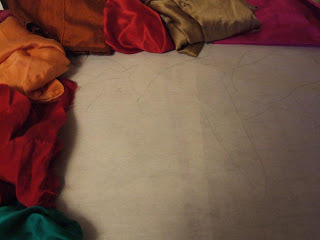 I put the box away, not having enough of any single fabric to make my intended project work. 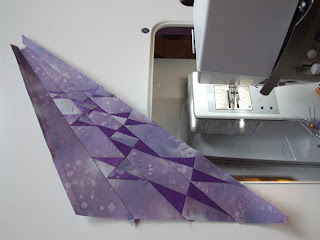 When I got up in the morning, I couldn't get to the sewing room fast enough to sew the block I saw in my head. I am having a great time, sewing this oh sew simple block. I had only intended to make placemats and runners, but yesterday afternoon I pieced enough blocks for a lap quilt. They're a bit addictive and such a terrific use of my leftovers. I spread the blocks on the floor to check the layout and for the first time ever, Maddie expressed an interest in quilting. He may look aloof and sophisticated wearing that black tuxedo and white shirt, but trust me...he can rumble! 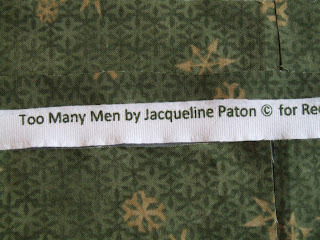 Really - too many men?! 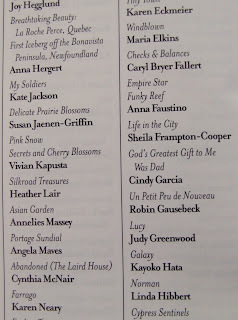 I Googled the collection and see that Ms. Paton is, of course, referring to snowmen! 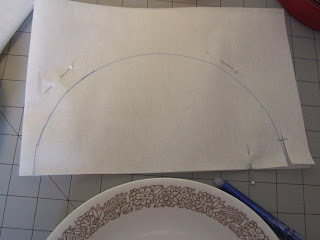 I am amused to think where this selvedge strip will end up in a future project. 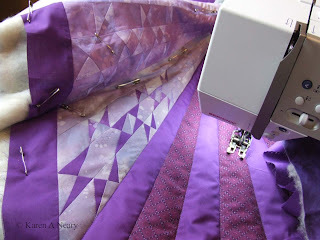 The dimensional patchwork went together slowly, one piece at a time. It was layered with wool batting. 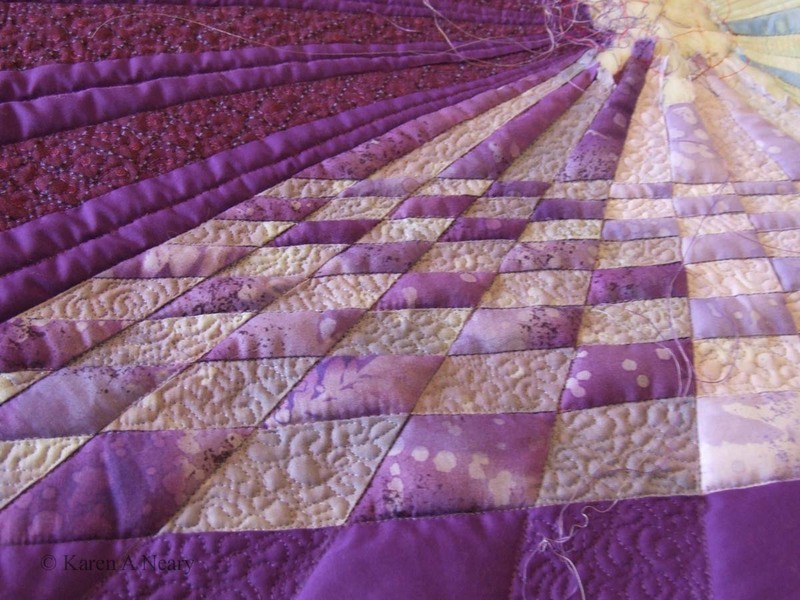 The quilting helped further emphasize the dimension achieved in the patchwork. The fine threads are Wonderfil's "Invisifil", a 100 weight filament. 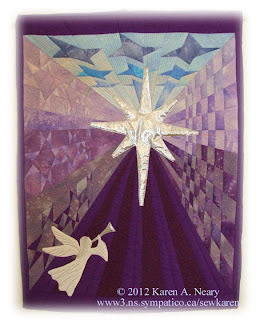 An angel was added after the quilting was complete and highlighted with silver metallic and holographic threads. It's a lot of patchwork in a small space; the piece measures only 20-1/4" w x 24" l.